We added a fantastic review of yesterday's big Rock'n'Roll show at SAP-Arena in Mannheim, Germany. for making this tour a very successful one. Please note that Chuck Berry performed on November 22nd 2008 in Mannheim. to the local promoter & Chuck's European Agent Diba, "ill health". Q: Mr. Berry, first of all congratulations you got a new president in America, Barack Obama. What's your take on it? Berry: That's wonderful, perfect. This man has written history. Q: What would you have said if someone had predicted a colored president 50 years ago? Berry: Back then I was too busy at school and such stuff. Whatever, this is just a start. We have got a lot of problems in the USA and we are happy that there now seems to be someone who gives the impression that he could resolve them. Q: When you kicked off your career there was music like Blues, Boogie Woogie, Jazz, Gospel or Country. What did you look for to create Rock'n'Roll? Berry: You know what? I don't know. I did what I wanted to and Rock'n'Roll did what it wanted to. I suspect we liked the same things. Q: You call yourself the originator of Rock'n'Roll. Do you remember the reaction this new kind of music created, especially from parents of this generation? Q: Back then musicians like you, Elvis Presley or Jerry Lee Lewis shocked the society. Did you enjoy shocking people? Berry: I liked it and you know what? I am still shocking people. Q: Today's songs do not have the potential to become hits. Your songs/evergreens on the other side are still here after 50 years. Berry: Well, I wrote 287 songs and I can only remember 7, maybe 10 of them. That's something else. I don't think I should decide which song does become an evergreen and which does not. Q: But one of those everygreens is "Johnny B. Goode", released in 1958. Some people call it the "greatest Rock'n'Roll song of all time". What does this song mean to you after all these years? Berry: What does it mean to me? I wrote a song which some people call the happiest song in the business. And I appreciate it. I also appreciate that it was succesfull enough to be send to universe. This song is still travelling. Only God knows where it will land and maybe someday it will even return. But the day it comes back, I will have left this place. Q: That was 1977, when Voyager 1 rocketed into the sky with "Johnny B. Goode" aboard. What reactions would you expect aliens to show? 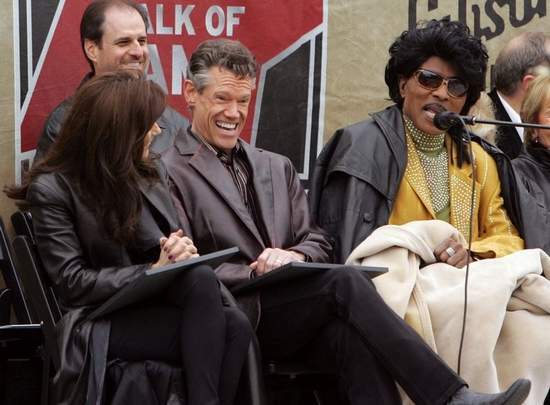 Randy Travis reacts to comments made by Little Richard, right, as Martina McBride, left, smiles during the Music City Walk of Fame ceremony at the Country Music Hall of Fame Park in Nashville on Sunday. The three music legends were all inducted into the Walk of Fame. Fans lined barricades at Hall of Fame Park in downtown Nashville this afternoon, waiting to catch a glimpse of the music stars — and one rock and roll legend — receiving stars on the Music City Walk of Fame. Country stars Trace Adkins, Martina McBride and Randy Travis, rock n’ roll architects Little Richard and Elvis Presley, celebrated soul performer Michael McDonald and the first Country Music Association executive director, Jo Walker-Meador, made up the Walk’s fifth class of inductees. All of them (save Elvis, who was represented by Imperials band member Joe Moscheo) came out in the 40-degree weather to see the unveiling of their sidewalk stars. “It’s just a huge honor,” Adkins said before the ceremony. “I feel quite frankly out of place here, being honored on the same day as Elvis Presley, Little Richard, Randy Travis and Martina McBride, Michael McDonald…I mean, these are people that I’ve been in awe of, and now I find myself in their company. It’s humbling, but I’m proud at the same time. A decidedly un-country singer like McDonald, on the other hand, saw his place in the “Music City” tradition. “Nashville has a certain special allure to songwriters. Some of the greatest songwriters in pop music — not taking anything away from Memphis, New York, L.A. and Detroit — for a town half the size of all those places, certainly holds its own in terms of having that strength and incredible love for songwriters and good songs. Some of the foremost artists over the years that have blurred the lines between genres, many of them came from out of the country genre, but had songs that topped the pop charts. Fans held homemade signs and cheered the loudest for Adkins and McBride, but the charismatic Little Richard — bundled up in blankets over a flashy yellow suit — quickly became the star of the show, speaking in rhyme, professing his love for Adkins’ song “Muddy Water,” even letting out a trademark “woo” during his speech. “I love that, because that’s the truth,” he said. Little Richard performed a medley of "Good Golly Miss Molly", "Keep A Knockin'" and "Lucille"
at CBS Morning Show on November 10th 2008. Little Richard's surgery, originally set up for November 1st 2008, has been postponed. No new date has been set as of now. 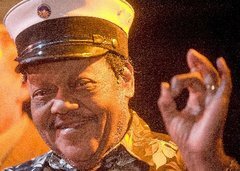 Fats Domino at Tipitina's on Nov. 5. Bartenders donned tuxedo shirts and black bowties and a red carpet ran across the Walk of Fame on the Napoleon Avenue sidewalk as Tipitina's hosted the Wednesday night premiere party for the documentary "Fats Domino: Walking Back to New Orleans." Domino himself made a rare public appearance at the party. Representatives of the Recording Academy presented him with replacements for his Lifetime Achievement Grammys, which were lost to Hurricane Katrina. After accepting the awards, Domino -- clad in a short-sleeve Hawaiian shirt, white slacks, tennis shoes and his omnipresent captain's cap -- reminded the audience that he's "not much of a talker" in his brief thank-you remarks. With that, he disappeared through the club's backstage entrance to relax in an outdoor lounge area with his preferred beverage, cold bottles of Heineken. 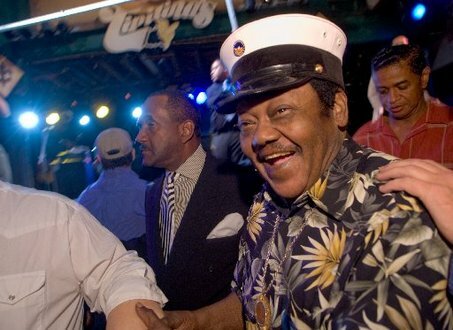 Fats Domino makes his way through fans Wednesday at Tipitina's during the premiere party for a new documentary about him. He stayed outside during the screening of the documentary. Funded in part by the Tipitina's Foundation, the film combines historical information with an account of Domino's post-Katrina odyssey and footage from his May 2007 performance at Tipitina's. It will air on nearly 200 PBS stations nationwide starting later this month. Local PBS affiliate WLAE starts running the show on Nov. 16. Among the 100 or so guests invited to Wednesday's party were acoustic bluesman Owen "Big Daddy O" Tufts and pianist John Autin, founder of Rabadash Records, the label for which Tufts records. Tufts grew up listening to Domino's records. Even though he faced a nearly two hour drive home to Mount Hermon after the party, "there was no way I was going to miss this," he said. 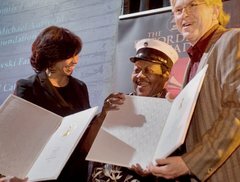 The Recording Academy's Angelia Sanders, left, and Jon Hornyak, right, present Fats Domino with replicas of his Grammy award. will be broadcasted again on national German & Swiss televison. According to Chuck Berry "nothing was cancelled" and "he played 11 dates for 11 pays of money". But the fact remains he played only 9 out of the 11 scheduled shows. Upcoming Chuck Berry European Tour! Chuck Berry will kick off his European Tour next Monday in Zurich. For a full schedule, visit the Tour Information section. Please note that Chuck Berry is contracted to do these shows, they are therefore confirmed. Paris promoter fools fans by offering 1,85 € refund! Believe it or not, but Didier Hunsinger, promoter of the Paris show, offers those who wanted to see Little Richard only, a 1,85€ refund, claiming that the "most important" part of the show would take place. What a scandal! First this agency Music Machine lies to fans, announcing Richard for weeks after his official cancellation and now they offer such a "generous refund". Saying that Richard only makes 1,85€ of the ticket price is definitely another lie. at the show in Paris, nov. 14, we would like to have a refund of our tickets. Where to send the tickets etc. etc.